Enjoying the Beautiful Sunrise at Bromo. Getting the service of rental jeep at Bromo by cheaper price can be such a good idea for you who want to explore Bromo. Perhaps it will be your first time enjoying and visiting Mt. Bromo so that you might need more references for what you can do there and even what you need to prepare for enjoying so much fun at Bromo. Of course, there is a bunch of great things and even activities that can be done by the visitors at Bromo. You can enjoy the beauty of Bromo with its amazing nature, enjoying the extreme activities, and of course enjoying the fun exploration at Bromo. The culture of the native tribes there are also that unique to be known. They have the unique tradition and culture to be enjoyed as well. That becomes one of the recommended activities which can be enjoyed when we are in Bromo. 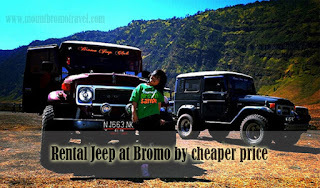 Then, renting a jeep to reach Bromo is a good idea so that you will get a bunch of fun and of course, it will make your journey to be much more enjoyable and really fun. For sure, any of you are interested in finding the best idea for dealing with the best experience in your vacation. If you are going to visit Bromo, of course enjoying sunrise there becomes one of the to-do lists there. For getting the comfort to reach the best spot for the best sunrise view there, you can simply find the rental jeep at Bromo by cheaper price. That would not be that difficult because there are so many jeep rental providers which we can find there. You do not need to waste your time and energy for reaching the spot since you have to be there on time for preventing getting missed of the sunrise moment. There any tourist attraction will be visited around Bromo by this Jeep such as Mount Penanjakan 1 (to see the sunrise), Bromo crater, Whispering sands of Bromo and the last trip is visit the Grassland savanna Bromo. As we have said before, renting a jeep to enjoy the comfort when reaching the best sunrise spot at Bromo is really recommended. That will give you simplicity and of course comfort. You also can reach the spot sooner. However, you need to be selective on finding the rental of the jeep there. Do not forget to deal with the price. Choose the best price one but never forget to notice the facility which they offer. Then, you also need to consider the condition of the jeep in order to deal with your safety, and also your comfort. Considering the driver is a also another good thing to deal with on choosing the right rental Jeep at Bromo by cheaper price. Explore mount Bromo tourist attraction will be more fun if you take by Jeep, cos You will get a lot of experience whom you still never get before.